Everybody loves letters. To be fair, most people love letters the way they love air—as something completely taken for granted yet absolutely necessary for getting through the day (or even through the next five minutes, as our obsessive device use would imply). But self-proclaimed typography nerds are burgeoning, and while digital fonts are well and good, the printed word is still—is increasingly—the ultimate form of lexical expression for connoisseurs. Spend just a bit of time poking through shops in Brooklyn, for example, and you are practically guaranteed sightings of some witty and truly wonderful letterpress. There is another level of beautiful, handcrafted lettering, though, that gets far less attention. In Nancy Sharon Collins’ paper “Engraver, communicator of content” she looks at the under-appreciated significance of engraved lettering within the history of typography. In the hierarchy of the international typographic canon, engraved lettering, on its own, sits fairly low. There are practical reasons for this position, and this article does not contest the general wisdom. Rather, it strives to amend the international typographic canon to include the engraved letter. This will be done through demonstrating how engraved lettering has significantly influenced the evolution of typographic form. In order to stress the influence that engraved lettering had on the development if typography, its economic inconvenience notwithstanding, Collins looks at four very impressive bibliographic examples: The Great Mirror of Folly (Het Groote Tafereel Der Dwaasheid) (C. 1720); Samuel Sympson’s A New Book of Cyphers (1726); George Bickham’s The Museum of Arts: or, The Curious Repository (1745?) and The Lincoln Crest & Monogram Album (c.late 1800s). 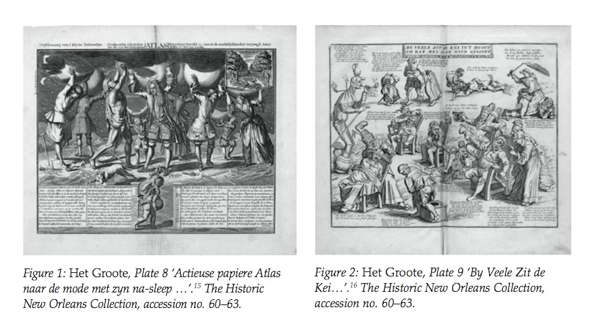 Het Groote is fascinating because it gives the viewer a chance to look at different styles of engraving: figurative or typographic, beautifully rendered or crude (see Figures 1 and 2). Examined as a specimen of typography, it is unique in that so much of the text is engraved. This offers a novel opportunity to view a large number of engraved characters in running text, unlike most engraved specimens in which text is usually reserved for brief inscriptions, titling and attribution. 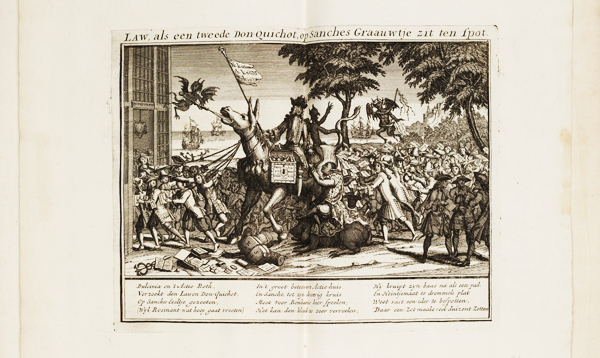 When examining the engraving, it is obvious that the figurative work in Het Groote was engraved by more than one engraver and the lettering also appears to be engraved by a variety of hands as well. Evaluated from an educational point of view, the book is a supremely delightful example of what can be done with copperplate engraving, reminding us that engraving can be a wildly creative and emotive medium. This echoes back to the original generation of painter/engravers, (roughly from the dawn of print engraving in the 1540s to the mid­1600s) when engravers created pictorial content from their mind’s eye and not as the craft evolved into mere portraiture or copy work (Hind 1963: 118–39). For the Victorian-era middle classes, it was important to follow the aesthetics and social norms of one’s peers, but also to satisfy some sense of individual style. ‘The success of the middle-classes in the Victorian period can be seen in their ability to universalise a set of principles based on individuality and progress’ (Loftus 2011). Factories spewed out consumer goods at ever increasing rates, and mass media in the form of newspapers, magazines and periodicals were in ever increasing abundance. Advertising was a new medium, and it abounded with reasons why this or that product was a household necessity (Meggs and Purvis 2006). A perfect example of this is Lincolns Fourth Edition that contains 52 pages of advertising alone! Display and advertising types were new, showy and more aggressive than those in previous generations. Thus it would have brought every manner of type and new letterforms into the parlour, the boudoir and anywhere there was light enough to read. While monograms, and monogram collecting, satisfied some new­fangled Victorian urges, it also introduced new kinds of typography to an eager and willing audience. 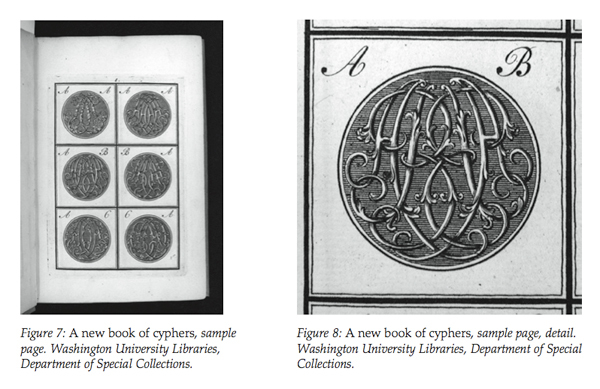 Studying historic examples of engraving, in a typographic context, may not change definitions on the nature of type. Hopefully, though, spending time with these case studies has added a haptic layer of experience in the great legacy of the formal aspects of communication. In the words of Terrance Weinzierl, type designer and advanced data finisher at Monotype Imaging, who just finished designing two of the new digital fonts based on old engravers’ lettering styles mentioned at the beginning of this article, ‘[a]s a designer, the revival projects I’ve done – like Romany and now JMC Engraver and Feldman Engraver – have not only helped me understand typographic history better, but helped me learn how to build professional-grade fonts’. Nancy Sharon Collins is a stationer/graphic designer, sole proprietor – Collins LLC, AIGA New Orleans special projects director, typography and graphic design instructor at Delgado Community College and instructor of graphic design history at Loyola University, New Orleans. Her book, The Complete Engraver, was published by Princeton Architectural Press in September 2012. Articles she has penned have appeared in AIGA Voice, Mohawk Fine Paper’s Felt & Wire and Neenah Paper’s Against the Grain. Book 2.0 is a new, interdisciplinary peer-reviewed journal which aims to publish articles and reviews on developments in book creation and design, (including the latest progressions in technology and software affecting illustration, design and book production). It will also explore innovations in distribution, marketing and sales, and book consumption, and in the research, analysis and conservation of book-related professional practices. Book 2.0 aims to provide a forum for promoting and sharing the most original and progressive practice in the teaching of writing, illustration, book design and production, and publishing across all educational sectors.